THIS TRIP HAS BEEN CANCELLED due to Jimmy’s health concerns. We apologize for any inconvenience. This brand new show pays tribute to the life, the music, and the wonderful man himself, Mr. Andy Williams! 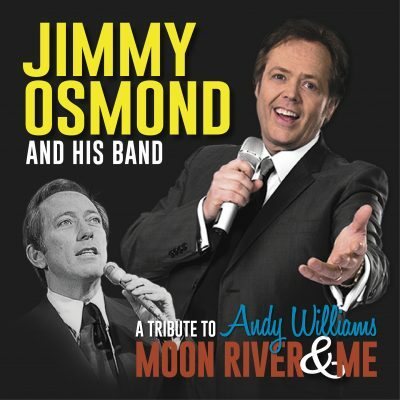 The sensation Jimmy Osmond stars in this dynamic production that features award-winning music, video footage of Andy, and Jimmy’s own memories of the icon he knew as a friend and mentor. Hear Jimmy sing songs that made Andy Williams so beloved by millions including “Can’t Take My Eyes Off You,” “Almost There,” and “Moon River,” along with chart-topping hits made famous by Osmond and his brothers. Lunch, at MJ Steven’s, an old world English themed restaurant is included prior to the 3:00 PM show. This trip requires payment up-front and is 100% non-refundable but you can transfer the ticket to another person. Tickets are very limited and are sold first-come, first-serve. Minimal walking.